The territory of Bermuda attractions are some of the most stunning spots to visit on a vacation. This island Bermuda is more than just beaches and resorts. The island has many scenic spots and historic buildings that will fascinate your imaginations. Before we go into detailing about these amazing attractions let us give brief description of the island. Bermuda is a British dependency located in the North Atlantic. It is situated east of the North Carolina coastline and is not considered a Caribbean island. It is known as the “Jewel of the Atlantic.” The territory is comprised of a group of small islands with some connected by pathways and bridges. One of the things you must keep in mind when planning a trip to the island, it is not a Caribbean country. Therefore, the temperature is subtropical. This mean you will get lovely Caribbean temperate during the months of April to October while the temperature will be cooler during the other months of the year. This does not prevent the island from being one of the leading small island for weddings and beach vacation with its amazing resorts. Of all the unique Bermuda vacation attractions, the island’s caves are some of the most interesting to experience. Two of the most notable caves in the country include the Crystal Cave and the Fantasy Caves. These are just interesting work of nature and will stimulate the minds of the geology enthusiast. To really get the benefits of these lovely attractions, it is advisable that you use tour guides who will give you interesingt information of the stalagmite, stalactite and all that other lovely formations that make these incredible works of nature. There is also the Lake Cahow which is just a crystal clear body of water. Another interesting place to visit is the St. Catherine Fort. This is the best fort in the territory. It was constructed in the seventeenth century to protect the island from Spanish invaders by the government of the country at that time. This serves as a museum today displaying interesting artifacts about the island’s history. This is another of Bermuda vacation attraction that you will lovely to visit. Additionally, the capital of the island, Hamilton is also another great place to visit. There are many awesome restaurants and shops offering tasty dinners and memorabilia for visitors. The Dolphin’s Quest is another lovely spots to visit. The location offer great opportunity for visitors to swimming and interact with dolphins. This is a must visit attraction for both children and adult visitors. We have mentions that the island has lovely beaches. Two of the top beaches in the Bermuda include Chaplin Beach and Horseshoe Beach. These beach spots are lovely for visitors wanting to scuba dive and snorkel. In addition, there are some reasonable budget resorts at these locations. There is the Astwood Cove location as well which provides an excellent setting of weddings and photo taking. This location also serves a one of the most notable spots for picnicking and spending time with loved ones. The Bermuda maritime Museum and Bermuda Aquarium, Museum and Zoo are also wonderful places to visit on the island. They give access to artifacts, notes, coins, documents; over 200 species of fishes, and for mammals you can see over 300 species of birds and reptiles. Bermuda is one of those islands that cater for all types of vacationers. 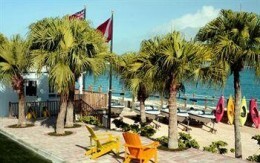 There are lovely Bermuda vacation rentals for those who may be tired of the resorts and hotels experiences. However, for visitors looking for lovely hotels and resorts the island has a lovely stock of all inclusive, luxury and regular hotels that you can choose from. Bermuda vacation attractions are lovely to enjoy. You will find a perfect blend of historic sites, excellent geographic formations, amazing pink sandy beaches, great resorts, excellent restaurants and fine weather. Make this island part of your next vacation plan and experience some of the amazing Bermuda attractions on offer.